Photos were posted by Pasco Police Department on their Facebook page. Various news media carried the story such as KOMO and the Tri-City Herald. A car skidded in the snow attempting to cross in front of a semi-trailer. 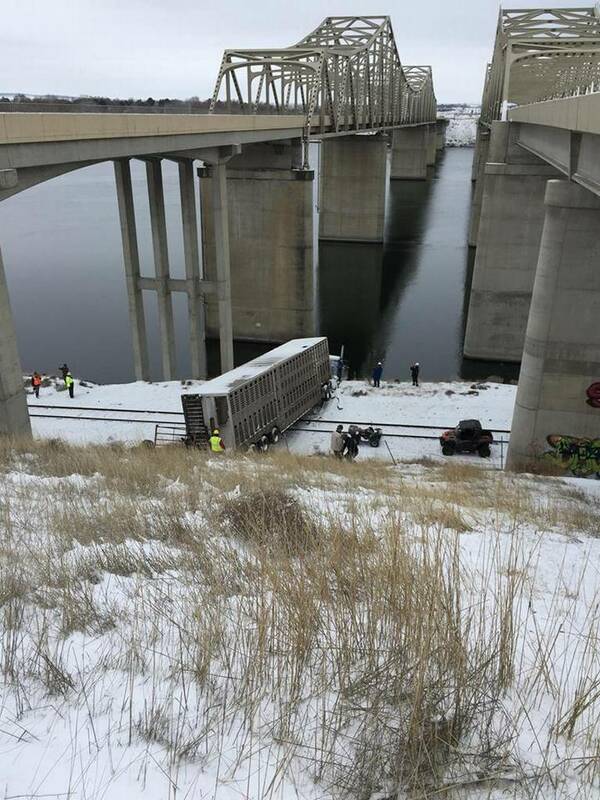 The driver of the trailer tried to avoid a collision but the rig went over the embankment. Thankfully, both drivers were unhurt and the truck did not land in the Snake River. This crash on 2/4/19 at 4:45 PM, i.e., Monday afternoon during a snow storm, resulted in landing on a railroad track on the edge of the river. The trauma of the wreck must have been a shock to the cattle. Their life in Canada was probably not wonderful, and their fright of being shipped to some unknown fate must be horrendous. The temperature overnight was somewhere around 21 degrees Fahrenheit while the cattle were kept confined in the semi-trailer by the river. I see hauling recommendations on internet sites that having a tight load makes the ride efficient as regards the cattle not moving around in the truck. Regarding temperature, sites advise that beef cattle are ok to be pretty cold down to about 19 degrees if there is no strong wind (and no trauma I assume). The news from the Pasco Police Department and that gathered by news media doesn't indicate how many were on board, as far as I can tell. Tuesday they were allowed out of the wreck. Only USDA representatives are authorized to let a group of cattle out of their trailer following the USDA inspection at the US/Canada border. They were herded onto another transport to complete the journey to doom. A video of herding a few is just 15 seconds long. The Tyson meat-packing plant where they were taken to be killed Tuesday was only 8.5 miles southeast of the crash site. This area is where the Snake River flows into the Columbia River. Pasco Police took photos and made two Facebook posts prefaced by "Holy Cow!" There are thousands of views, shares, likes and comments. 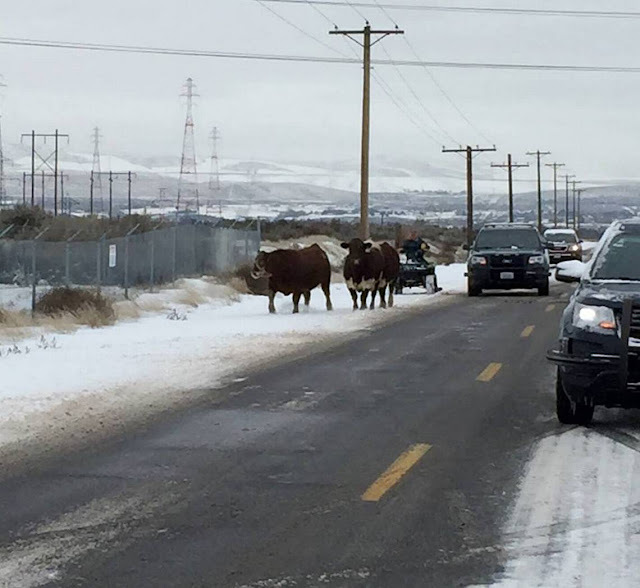 Sad to say, many meat-consuming commenters are making copious fun of cattle and the incident. 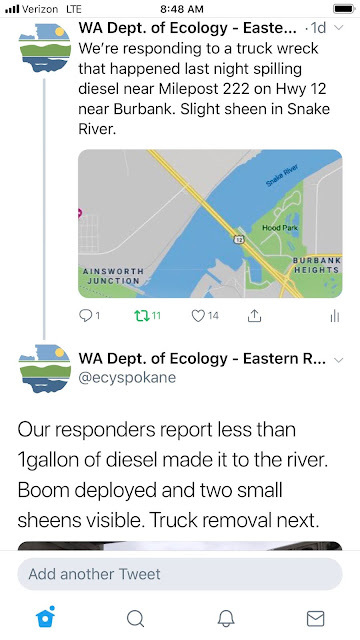 According to the Department of Ecology, only about one gallon of diesel reached the river. Also very lucky. In seeking elaboration from the Department of Ecology, I learned their "responders estimate spill amounts based on the size of the fuel tanks, the amount that remains in the tanks, etc. 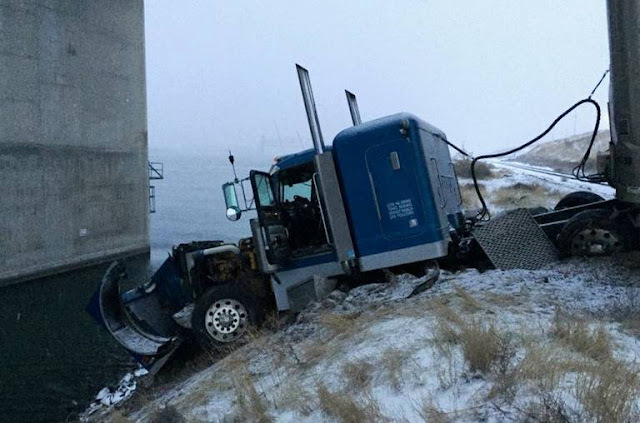 In this case, the soil soaked up most of the fuel and fortunately the spill into the river was relatively small." Their responder also said, "it would be difficult to get the truck removed because there are no roads leading to it. There will need to be removal of oiled soil, also, at some point." Governor Inslee of Washington initiated a major task force to try to save populations of orca whales if at all possible. This will involve many things including saving their prey which is said to be chiefly Chinook salmon. The Snake and Columbia are home to Chinook salmon. There are huge efforts that are going to be involved with orca recovery. Safe transport needs to be a priority so that trucks and ships don't spoil rivers, bays, sounds, and seas. Only consumers/voters can persuade the powers-that-be to actually achieve recovery. By the way, the federal government shutdown ended for the moment, but those USDA folks may still be waiting for their checks with back pay. They are also no doubt wondering whether a resumed shutdown will occur. I recommend the 2013 discussion in the Food Safety News magazine about Ted Conover's two-month experience as a bona fide USDA Meat Inspector at a beef plant in Nebraska in preparation for an article he subsequently for Harper's Magazine. Mr. Conover also wrote a follow-up article for Harper's in November 2016 (https://shar.es/am3hEa) explaining why he eventually gave up eating meat and wished he reached the decision sooner.